Mark Byrnes' recent Atlantic Cities piece Buffalo, Ten and Now (1902-2011) gloomily compares a 1902 Library of Congress map of the City of Light with modern aerial photography to perfectly illustrate the dangers of giving cars too much space. Miles of surface parking and elevated highways now blight the core of what was once vibrant transportation hub. In some cases entire streets have given way to, well, nothing. Thanks to the availability of several historic maps it's possible to make similar comparisons between the past and present of our own city. In most cases, the visible changes involve development rather than sheer destruction (i.e. tearing down without replacing), though many important heritage structures were also lost along the way. 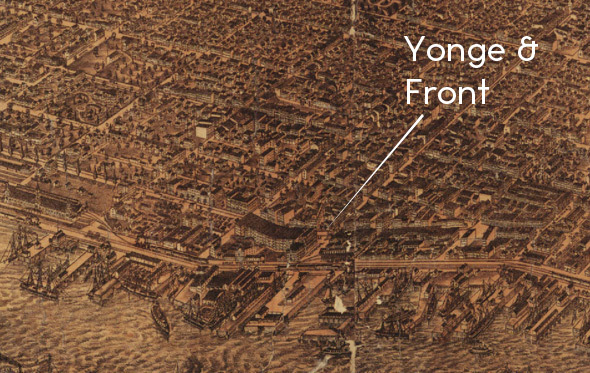 One thing that has remained mostly the same in Toronto, despite some name changes, is our street pattern, which, as far as downtown goes, was determined over 140 years ago. The map we've used here, titled Bird's Eye View of Toronto, dates from 1876 and the contemporary images are derived from Google's Satellite/Aerial maps, with the exception of the last, which is from Bing. Doing direct comparisons proved a challenge given the differing perspectives of the maps in question. 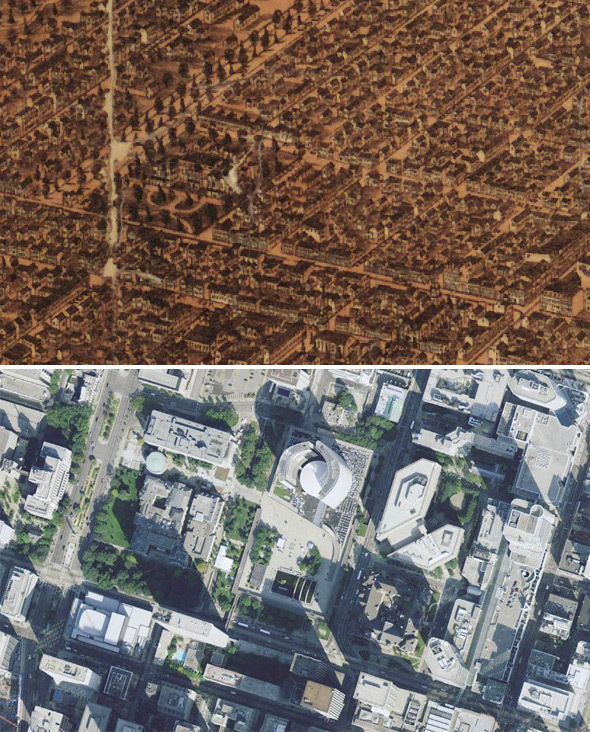 In many instances, we've tilted the modern day aerial views to better match the older map than they "naturally" do. 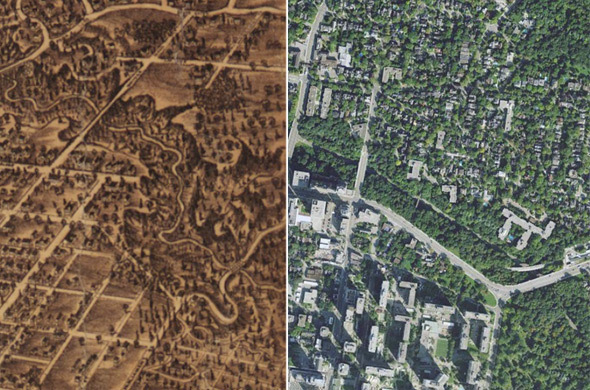 Nevertheless, despite the lack of perfection, we think the exercise should prove intriguing for those who've wondered about just how much Toronto has changed over the years. Here are some noteworthy examples, and thanks to Atlantic Cities for the idea. The lead image depicts the before and after view, while the map view immediately above shows a wider area. The comparison might be a bit confusing at first glance due to the differing angles, but what you have a view of is Niagara Street running south from Queen alongside the now-buried Garrison Creek. In 1876 Niagara curved toward the lake shore matching the path of the ravine. Today it maintains the same course even though the river is no longer above ground. Today's Walnut Avenue sits on the path of the old creek. The original Gooderham & Worts Distillery hasn't been completely preserved (it used to sprawl beyond its current "district"), but a number of the buildings that house restaurants and art galleries today were around in 1876, servicing the alcohol-related needs of thirsty Torontonians until prohibition temporarily reared its ugly head in 1916. 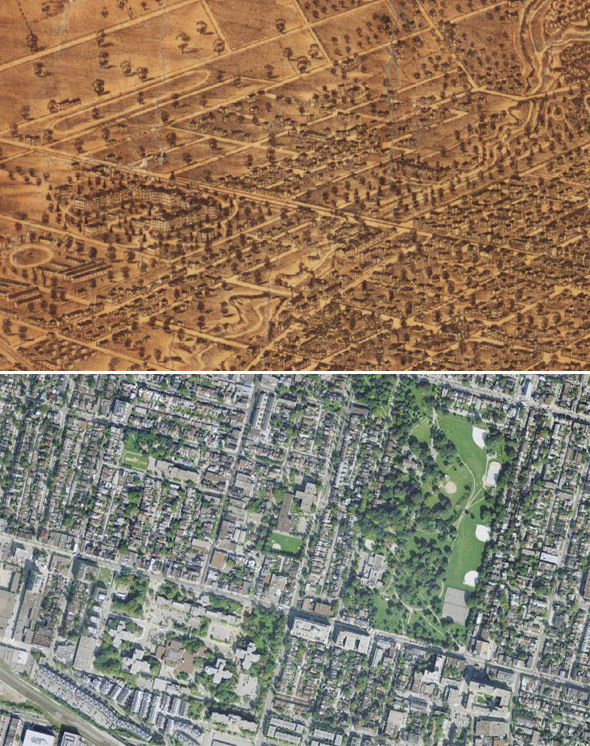 Two crucial markers of West Queen West can be spotten in the top and bottom images, though each have changed greatly over the years. 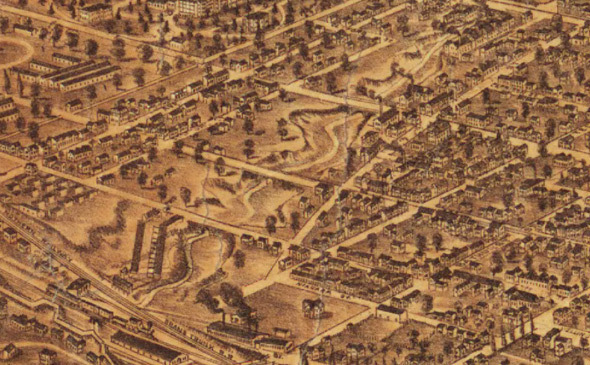 To the bottom left you have the Provincial Lunatic Asylum which is now the site of CAMH (all of the former structure that remains is the brick wall that faces Shaw Street south of Queen), and to the upper right you have Trinity Bellwoods Park, partially named after the College that is visible in the 1876 map. 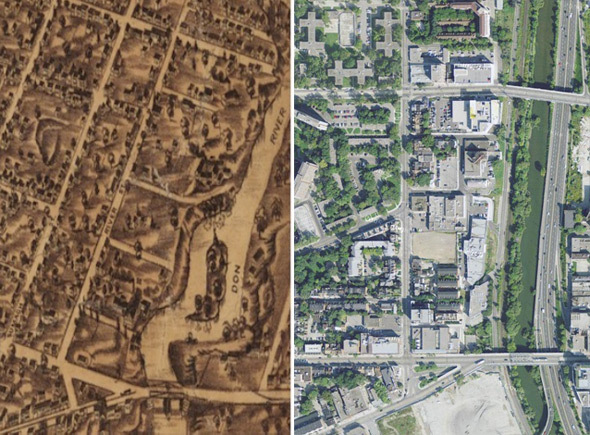 The University of Toronto campus and current-day Queen's Park area show many hints of their contemporary makeup in 1876. 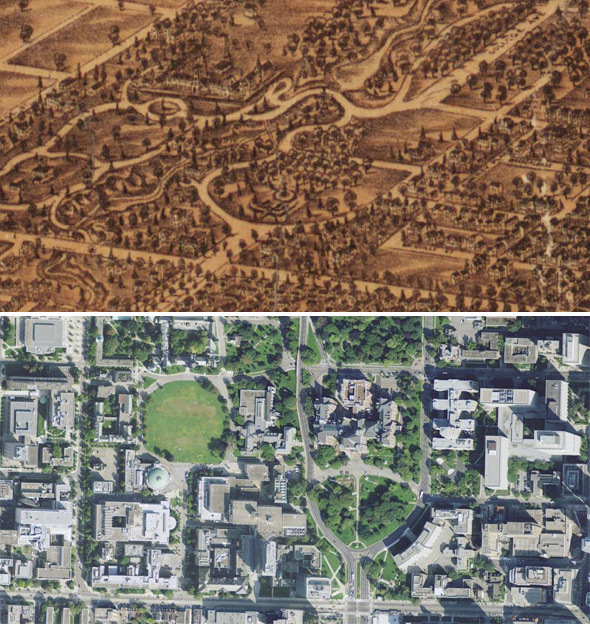 Not only is University College present in both the before and after images, but King's College Circle and the loop around the legislature were already laid out (though not quite the same) over 135 years ago. In terms of differences, along with the growth of the campus, College Avenue has graduated to University Avenue and Taddle Creek, the winding stream parallel to the road, has now vanished. 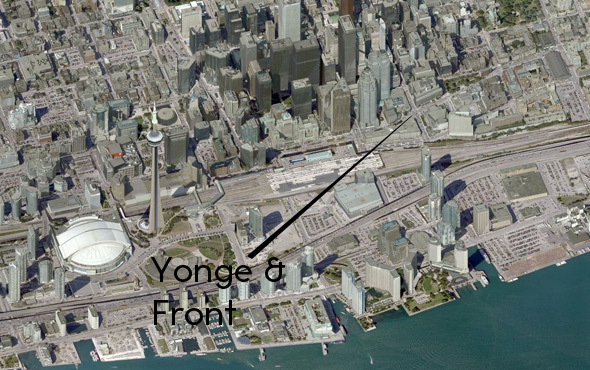 The shoreline might have moved further south and been replaced by the Gardiner, but Fort York is still easy to recognize on the old map. The Fort that's visible in 1876 is, however, markedly different than what exists today on account of the war of 1812, when the previous iteration was destroyed in the Battle of York (part of the war of 1812). Railroad tracks still exist on the northern edge, as does the Bathurst Street Bridge (though in less rickety form). In 1876 Osgoode Hall marked the southern terminus of College (now University) Avenue. Today the street continues through what was once the middle of a city block. 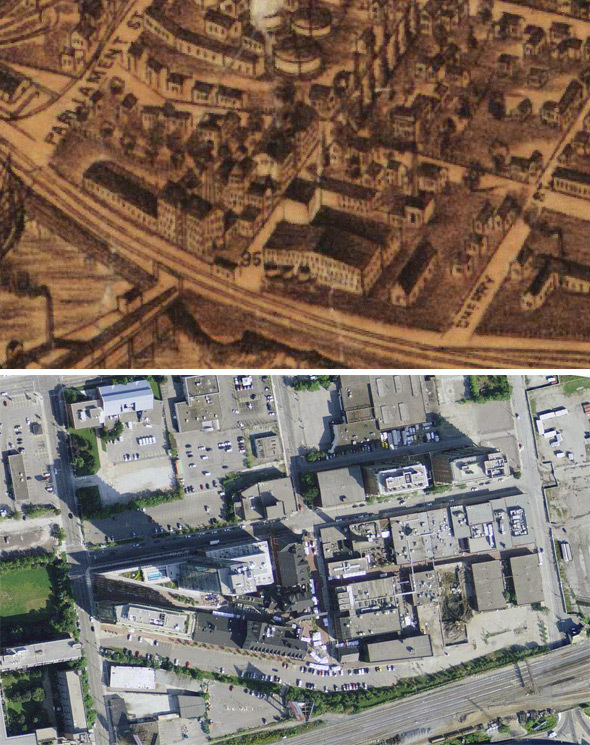 Chestnut and Elizabeth Streets east of Osgoode Hall in the upper image have also been trimmed to make way for Nathan Phillips Square and new City Hall. 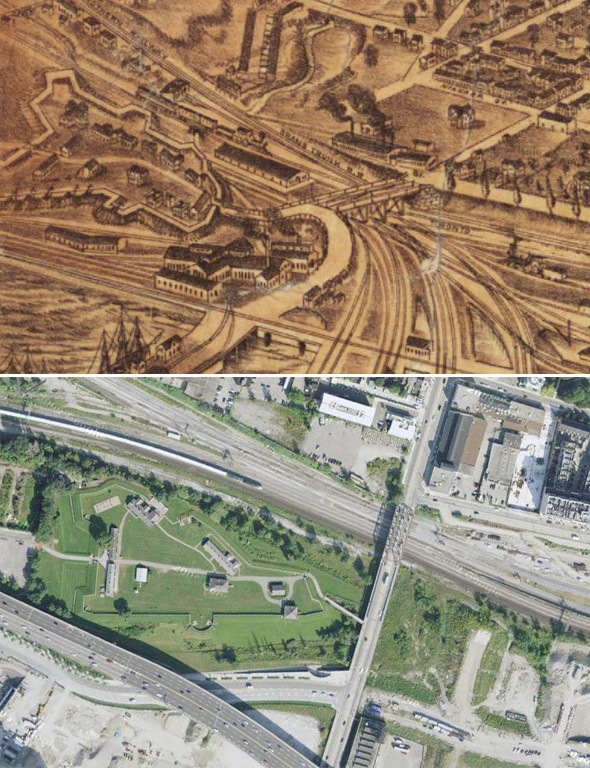 Once a formidable obstacle, Rosedale Valley has now been tamed by the Bloor Viaduct, the first part of which involved filling in the southwestern side of the ravine to extend Bloor Street south before heading over the Don Valley. Initial plans called for one long bridge straight over both valleys, but residents expressed concern that such a strategy would cause too much harm to the valley seen in these images. This combination contrasts the Don River's original meandering course with its now virtually straight route down to the Keating Channel. The meeting of King and Queen streets is almost identical in both images except for the entrance to the Bayview Extension cut into the triangular space west of the intersection. Sumach Street is the most altered of the routes shown here due to the addition of a cluster of high-rise apartment buildings. While the images above and below are remarkable for how much has changed â the rise of the modern skyscraper and the encroachment of the city onto the water â they're also fascinating on account of what's stayed the same, namely the street grid north of Front and the fact that Toronto's downtown core has remained a vibrant place over all of these years.